AutoUpLinkUSA has been appointed as a preferred provider by eBay Motors for the eBay National Auction and the eBay Local Market Program. We can take the photographs, build the listing, and assist in managing your account so you can focus on answering leads and selling your inventory. Now it’s easy and seamless to list your inventory online with eBay Motors too! AutoUpLinkUSA’s eBay Easy Lister™ tool is your resource to vehicle remarketing on eBay’s National Auction site as well as with the eBay Local Market Program. Leverage your existing inventory and photo data collection to quickly create and manage your listings on eBay. Use multiple pre-designed templates and striking photo layouts, complete with zoom capability, for a professional presentation. Target buyers across town or across the country. Create visual condition reports using our simple checklist form. 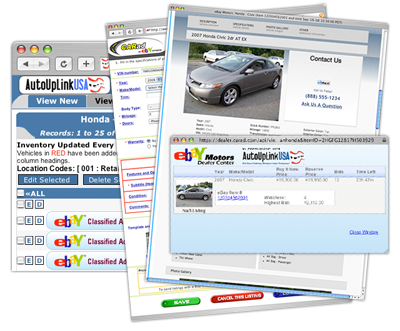 Keep an eye on your active auctions and local classifieds without leaving the AutoUpLinkUSA Internet Inventory Manager (IIM).